Check our prices before you shop for jewelry anywhere else! Our prices are lower than fine jewelry stores and department stores. Each of our locations carry a unique selection of one of a kind vintage and estate jewelry and if you cannot find an item that suits your need, our sales staff would be happy to check the inventory in our other stores for you. 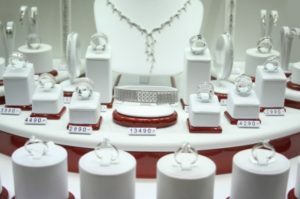 Come and explore our exciting collection of gold and diamond jewelry. Modell also offers an interest free layaway plan. Please speak to our sales staff for details.